Hopefully you have recovered from your turkey hangover (and/or your alcohol hangover) because now it’s time to get ready for Christmas. I love everything about Christmas: decorating, shopping, spending time with family and friends, eating, drinking, and being merry. It’s my most favorite time of year and I will admit, I am one of those people who starts listening to Christmas music in early November and our Christmas tree was decorated before Thanksgiving. I can’t help it. Holiday Festival of Lights: 2016 marks the 27th Annual Holiday Festival of Lights in James Island County Park. Year after year, my family and I have enjoyed riding through the 3 illuminated miles of light displays while listening to Christmas music. So far, my most favorite memories have been riding through with my two young nieces and seeing their faces light up while oh-ing and ah-ing over all the light displays. After the driving tour, you can park your car and enjoy all the family friendly activities which include and meet and greet with Santa and roasting marshmallows. You can enjoy the lights from November 11, 2016 until January 1, 2017. Christmas Tree Lighting in Marion Square: Mayor John Tecklenburg and Santa Claus will join forces to light a gorgeous 60 foot Christmas tree in the heart of Marion Square. There will be live music and is a great time for everyone. City of Charleston Holiday Parade: Hosted by the City of Charleston and the Charleston Fire Department, the parade will begin on Broad Street at Barre Street, travel North on King Street, and conclude on Calhoun Street at Meeting Street. This year, Todd and I will be joining some of my fellow Dunes Properties agents at our King Street office for some snacks and libations. The parade will be on Sunday, December 4th at 2pm. The Nutcracker at the Charleston Gaillard Center: This is one of my absolute favorite things to do during Christmas time. This year’s performances will be on December 10th and 11th. New Years Eve at Circa 1886: Located in the original carriage house of the Wentworth Mansion, Circa 1886 is one of the best restaurants in downtown Charleston. You can enjoy a 6 course pre fixe dinner along with a complimentary glass of champagne. It is both a cozy and romantic way to ring in the New Year with your special someone. 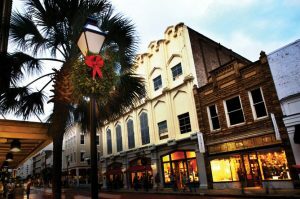 Even if you aren’t able to make it to any of these, pick a day and walk around downtown Charleston. It really is incredible this time of year, and I promise you won’t be disappointed! I hope you and your family have a wonderful Holiday Season! There will be a lot of new things coming to the blog in 2017 so stay tuned! Cheers to 2017!